Silver miners testing key breakout level! Silver miners (SIL) have had a rough 7-years, as the ETF finds itself nearly 75% below its 2011 highs. No doubt the long-term trend remains down. SIL is has declined 27% since the first of this year (See chart below), where it is testing a falling support line at (1), with momentum currently at the lowest levels in 5-years. While declining this year, SIL could be creating a bullish falling wedge, where it currently is in a tight jam between support and resistance. 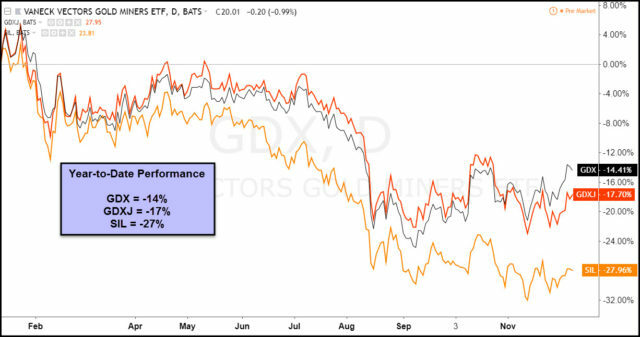 SIL has been a leader to the downside this year when comparing it to other mining ETF’s. If SIL would happen to break out, it would send a short-term bullish message to Silver miners, as well as GDX & GDXJ. The price action over the next few weeks in SIL could send a very important message to Silver and Gold Miners!